At Advanced Tree Care, we take our name seriously by staying at the forefront of advances in tools and processes for tree care, pruning, and cutting. We’re committed to using technology as it advances. One of the latest tools we’re using is advanced thermal tree imaging. 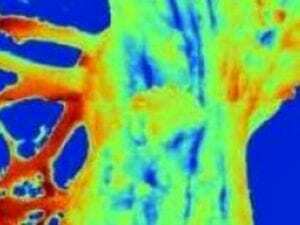 Thermal tree imaging uses infrared imaging to assess tree health. It’s a non-invasive method that can clearly distinguish between living and damaged stem tissues in trees. Why might it be important to assess the overall health of trees on public or private property? Tree care and maintenance are an important part of property management. If you’re a homeowner—or buying a new home—you’ll want to know how healthy your trees are, and if there are signs of damage or disease, you’ll want the best information possible. There are commercial considerations too: village administrations and commercial property owners need to attend to the care, maintenance, and replacement of trees on their properties, too. The reasons for doing so include public safety as well as historic preservation, in some cases. What is Advanced Thermal Tree Imaging? Advanced Thermal Tree Imaging takes a non-invasive deep look into the health of your trees to diagnose any issues. Thermal tree imaging is a highly effective way to determine how healthy those trees are, which ones need dead limbs pruned, and which ones might need to be removed. Traditionally, inspecting trees to determine health and structural integrity can be time-consuming and invasive. Trees need to be closely inspected. Often, the bark must be disturbed, or our staff has to climb the trees to inspect areas of interest. Invasive testing may be required. Thermal tree imaging changes all that. The technology gives us both great accuracy and efficiency at once. By taking and examining infrared images, we can distinguish between living and damaged stem tissues in the tree. We can make educated decisions—with clear evidence—about which trees are healthy, and which are diseased or damaged. Together with the property owner, we can make informed decisions about maintenance or removal. Not only is it non-invasive, thermal tree imaging is also much quicker than other methods of inspection—up to 1,000 times faster at providing the critical information we need. If we’re using thermal tree imaging to appraise the health of trunks and branches, we can inspect dozens of trees in a single day. If we’re inspecting a small, more specific part of a tree—perhaps the trunk only, for decay—that total can be even higher. So what is it we’re looking for with thermal tree imaging? We’ll tell you. In comparison to other living organisms, trees produce relatively low metabolic energy. Most of what healthy trees emit has already been absorbed by the surrounding environment. On the infrared images, a healthy tree will have relatively even water distribution between its cells and an even heat dissipation over its entire surface. If a tree is diseased or damaged, the image appears different. The flow of heat energy is interrupted, and cooler areas are apparent in the image. The more cooling there has been internally, the more effect there is on the temperature of the tree’s surface. Once identification of an issue is made, we can proceed with pruning, treatment, or removal.